As kids, we all somehow learned about the monsters living under our beds. Some of us were more frightened than others. As we get older, however, we discover that the real monsters are inside other people and sometimes inside ourselves! 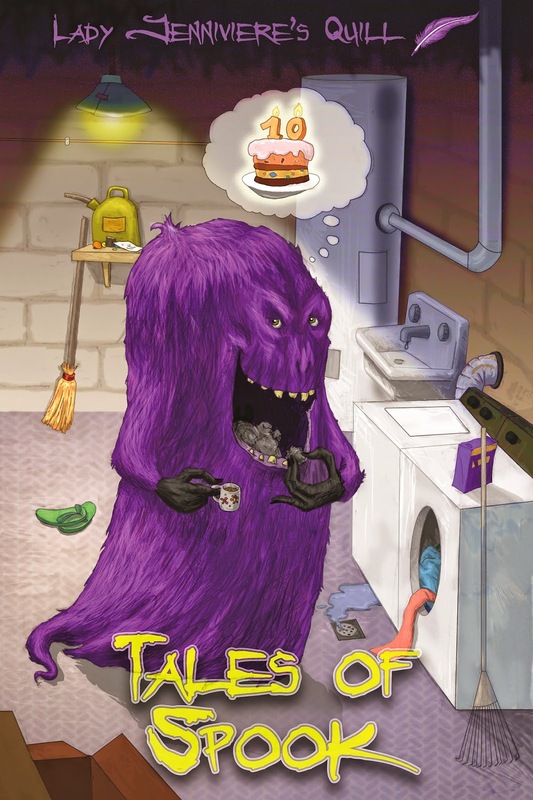 Tales of Spook is a great adventure for middle grade kids (ages 8-12) who are just learning to figure this out. The choices we make greatly determine the path of our lives. Sometimes good things happen to bad people and sometimes bad things happen to good people. We often wonder why. One day in her garden, Lady Jenniviere received a magic inkwell from an injured bird she had tended to. Now birds of all sorts show up in her garden to drop off feathers. With the combination of feathers and the magic inkwell, Lady Jenniviere has begin to transcribe all sorts of different stories for kids. The second installment from Lady Jenniviere's quill, Tales of Spook is the story of Noel and the monster who wishes to trade places with him. Noel has a fine life as a well-liked, only child to caring parents. Everything is fine until the night he meets Spook, the fuzzy, purple, dryer lint eating monster who has taken up residence in his basement. Spook kindly informs Noel of his plan to swap lives with him. Really the warning is just a chance for Noel to get used to the idea, but Noel has no desire to swap places with a lint eating monster! The rest of the story is left up to the choices that Noel, Spook, and Noel's best friend Stacy make. Do they make good choices? Who's the real monster here? You'll have to read and find out! Frances and I both enjoyed this book. It definitely doesn't turn out the way you are expecting it to. I received an e-book copy of this book for review. If you'd like to try it out, you can find it on Amazon at the link below. Please note that if you click this link, my family will receive a small commission. Your purchase price will not be affected. How fun! I think my 7 year old would really like this book. I think Spook might already live in close proximity to my dryer, because socks go missing at an alarming rate. I would take the dryer lint eating though indefinitely! They might be a little young for it at this point. I might read it to Henry, but not Benjamin. I would love it if I had a monster to eat dryer lint! Maybe he could even fold some laundry while he was down there!